Review of Academic Results: Can and Should Students Take Legal Action? Recently the High Court of Australia decided Minister for Immigration & Border Protection v SZVFW (2018) 92 ALJR 713;  HCA 30 in which it addressed the scope and application of appellate standards of review in Australia. The decision provided guidance on the approach an appellate court must take when applying the correctness standard of review to a decision of a court below and it provided guidance on the treatment of evaluative decisions, that are not discretionary decisions. The approach in Australia on both of these issues contrasts somewhat to other jurisdictions such as the United Kingdom and Canada which have developed differing jurisprudence on standards of appellate review. This article examines the implications of automation for administrative law, with a focus on the question of whether an automated decision is a “decision” for the purpose of the Administrative Decisions (Judicial Review) Act 1977 (Cth). In doing so, the article uses the recent decision of the Full Federal Court of Pintarich v Deputy Commissioner of Taxation  FCAFC 79 as a case study to illustrate some of the broader issues posed by automation for administrative law doctrine. In examining the implications of automation, we argue that there must be a flexible, modern interpretation of existing administrative law principles or the development of innovative new principles to address these technological developments. 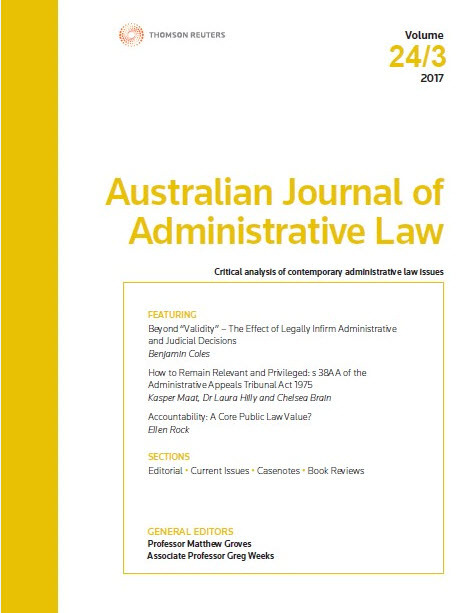 This article explores the applicability of the rule against bias to administrative decisions made wholly by automated systems, questioning the ability of Australia’s administrative law system to adapt to increasing digitalisation and automation of government processes. By examining the behaviour and characteristics of neural networks, this article demonstrates the ways in which bias may infuse the decisions of predictive automated systems. It subsequently reveals the difficulties courts will likely face in transposing the rule against bias to automated decision-makers, thus advocating the use of alternative grounds of judicial review to remedy defective decisions. Ultimately, the relevancy and reasonableness grounds; despite their similarly human focus, are identified as the most amenable to judicial modification. For the PDF version of the table of contents, click here: AJ Admin L Vol 26 No 1 Contents.